Round two: fight! 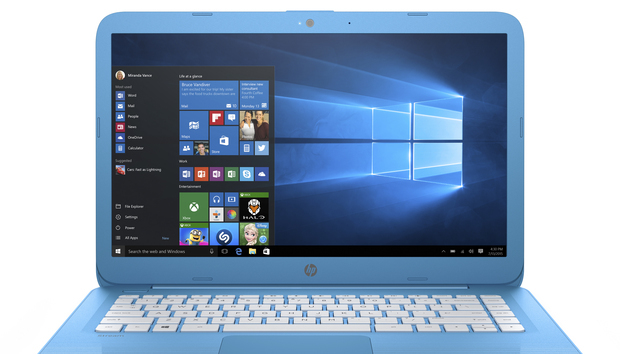 HP announced a refresh of its Stream notebooks, a budget-priced line of Windows 10 laptops that were originally seen as Microsoftian alternatives to Chromebooks. The latest Stream refresh includes an updated version of the classic 11.6-inch notebook and its “x360” convertible variant, as well the return of the 14-inch Stream. For the 2016-2017 lineup, HP is adding dual-antenna 802.11ac 2x2 Wi-Fi for better connectivity. The new Streams also have four color options (in select regions that we assume includes the U.S.), including blue, purple, white, and a black version for the x360 only. The new HP Stream 11 x360. Select models also include options for high-definition touch displays, and an HD WLED-backlit display that includes an anti-glare screen. HP did not announce an update to the 13-inch Stream. We haven’t seen a 14-inch model since the HP Streambook 14 was announced with the original batch of laptops in 2014. The base model of the new 14-inch Stream includes a dual-core 1.6GHz Intel Celeron N3060 processor, 4GB of RAM, 32GB of onboard storage, a digital card reader, and Windows 10 Home. The display on the standard version offers 1366-by-768 resolution. The notebook weighs 3.17 pounds and comes in under an inch thick, at 0.70-inches. The standard 11-inch model is similarly spec’d, with the same Celeron processor, screen resolution, RAM, and onboard storage as the 14-inch Stream laptop. The smaller device weighs in at 2.57 pounds and is actually just a hair thicker than the 14-inch model, at 0.71-inches versus 0.70-inches. Finally, we have the Stream x360, which also offers the same basic specs as its counterparts. But the x360 is heavier than the other 11.6-inch model, at 2.98 pounds, and is the thickest of the bunch at 0.78-inches. The impact on you at home: The new devices aren’t quite available yet. HP tells us that the new HP Stream 11 will be available on HP.com starting August 24 with the base model at $200, as with the previous refresh last October. The HP Stream 14 rolls out next on September 7, again on HP.com, with prices starting at $220. Finally, the x360 rolls out at an unspecified date in September with prices starting at $250, which is $50 lower than the previous generation’s x360 base price of $300. Whether that price reduction carries over to higher-end versions of the x360 is unclear.